The next snow storm to affect the south will spread across the region friday through Saturday (January 29-30). The greatest snow will be across southern Virginia into northwestern North Carolina. Some 6" + amounts will be likely. As the high center pushes low level cold air south, sleet and freezing rain will be seen for the interior of North Carolina, upstate south Carolina and possibly some of north Georgia. More of the sleet / ice predicted for our area. I would much rather see the snow. Ice can be a big problem. I guess that you're hoping that the GFS is right. The 6z run of the NAM had shifted the heaviest precip south of ORF. ORF is looking solid for a major snow on the latest models. 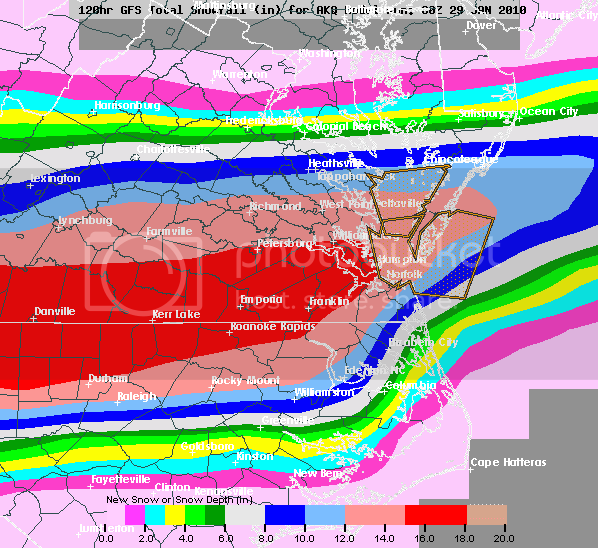 This WILL be a memorable snowstorm for the Tidewater of Virginia (and other locations too). I guess we had about 3-4 inches of snow here with sleet and freezing rain too. The folks up the road in southern Virginia had much more. What did everyone else see here on the east coast? The forecast was bad here.....hardly anything was predicted at first. About 4" fell here in northeast Maryland. There were much higher totals for the eastern shore to the south. 5-10" was common. A big storm for them! There was about 3 or 4 inches here in Chattanooga. The first good snow in quite a while. We also had sleet and some freezing drizzle too. I'm not too sure about this next one. Latest model runs have the Tidewater on the mix line. Maybe snow to rain back to snow at the end. Earlier in the week it certainly did have a sizeable snow storm.